A straightforward multi starting at the Great West Door of the beautiful church of St Germans. The church of St Germanus in the village of St Germans in south-east Cornwall is one of the finest, oldest and historic parish churches in the county, and one of the oldest buildings still in use for its original purpose. Set within an Area of Outstanding Natural Beauty and at the heart of the St Germans Conservation Area, the church is of exceptional architectural, art historical, archaeological and historic significance which is reflected in its Grade 1* Listing. An earlier building on the site was the cathedral for Cornwall between 926 and 1030, before the area was absorbed into the Diocese of Exeter just before the Norman Conquest. The Normans then built a Priory on the site of the old cathedral, and the present church building dates to the 13th century and has more original Norman masonry in its powerful and iconic west front than any other Cornish church; indeed it is one of the most significant Norman doors in England. 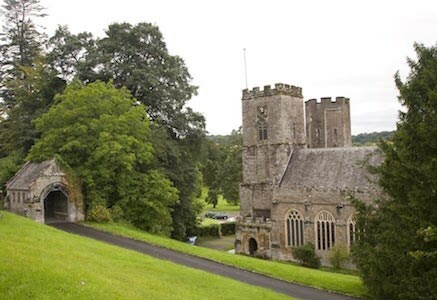 The monks lived on the site of the adjacent house of Port Eliot, which still has visible monastic 12th-century walls with lancet windows in the basement, though the rest of the monastic buildings were changed in the late 18th century. The Bishop sometimes stayed in a magnificent house at Cudden beake in the village. The monastery had a busy port and was an important attraction for pilgrims visiting St Germanus’ relics. The last Prior, Robert Swymmer, surrendered the Priory in 1539 and it was leased from the Crown by John Champnon in 1540 after the Kings agents had stripped everything of value, later passing to the Eliot family, who still live there today. St Germanus of Auxerre visited Britain in 429 AD. We do not have evidence that he visited the village, but the church and village were associated with him by the 10th century. The cache is not at the headline coordinates but is only a short walk away through the pretty village of St Germans.
! !Please take care - the road is a busy one!! The headline coordinates take you to the unmistakable Great West Door of the church which is Norman in origin and shows its links to the earlier cathedral that stood near this site. The toatal of your numbers should add up to 22. The cache is a short walk away but beware of traffic. Please be stealthy at the cache location - it is overlooked.